I’ve always thought that we should learn more about our passion for sport and how we could possibly harness that for our greater good once the event or game was over. This whole FIFA world cup thing has just reminded me again how important it is. We lost the chance to really thrive off the Rugby World Cup 15 years ago. I trust we won’t let that happen again this time. 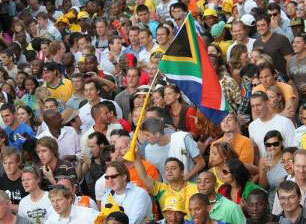 And I’m willing to bet that the Vuvu could be the unifying symbol for all South Africans as we rally around our national team. And that’s it. Despite all our differences we all feel that tinge of pride as we see our wonderful stadiums on television and realise that the world is watching us. Right here in our backyard. And yes, 34 years ago we were a fractured racist country that frankly none of us were partciularly proud of. 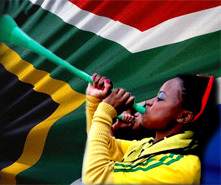 Now is a time however when we can blow those Vuvuzelas loud and proud and welcome the world to a new piece of world cup history. Hold No Grudges, Have No Regrets!